It was on sale, you couldn't resist it, it looked so odd, it called you by name, et cetera, et cetera. 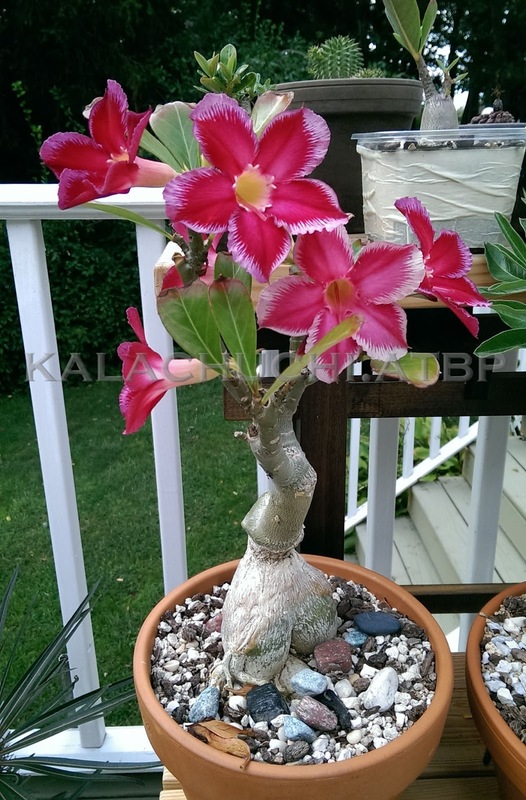 Whatever the reason, you end up walking out with your first store-bought adenium in a pot. What now? Because commercial nurseries are weird, your adenium most likely came in a plastic pot inside a fancy pot, planted in soggy peat-based material and sometimes, top-dressed with shiny river stones glued together to form a sarcophagus designed to make the plant inaccessible to your informed care. My rescued plant was sold this way, thankfully without the sarcophagus but sitting on a tray of water. I can not quite figure out what the tray was all about. The adenium, however, did scream weirdness; grafted as it was in this manner as you can see below in the second photo. Labels on store-bought adeniums are hopeless, of course. They always say "Desert Rose", maybe with an additional variety name usually consisting of random words strung together with other words like "surprise", "fiesta" or "wonder". For example, "Popcorn Number Surprise" or "Wonder Green Morgue". Since naming is completely arbitrary, this one has been named Fear and Surprise. 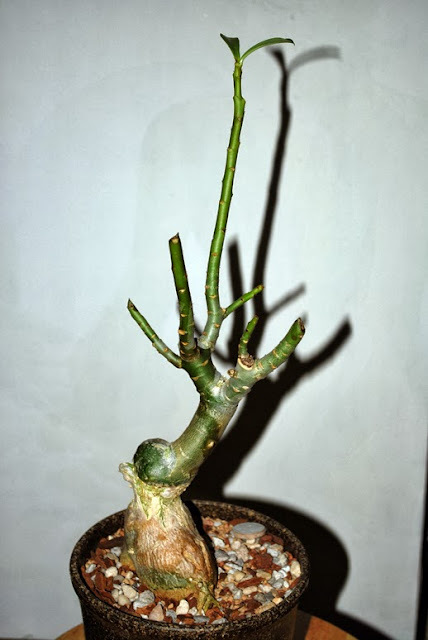 In general, you want to repot your adenium once a year or once every two years. Repotting does not automatically mean potting-up. It just means changing the soil with fresh stuff. 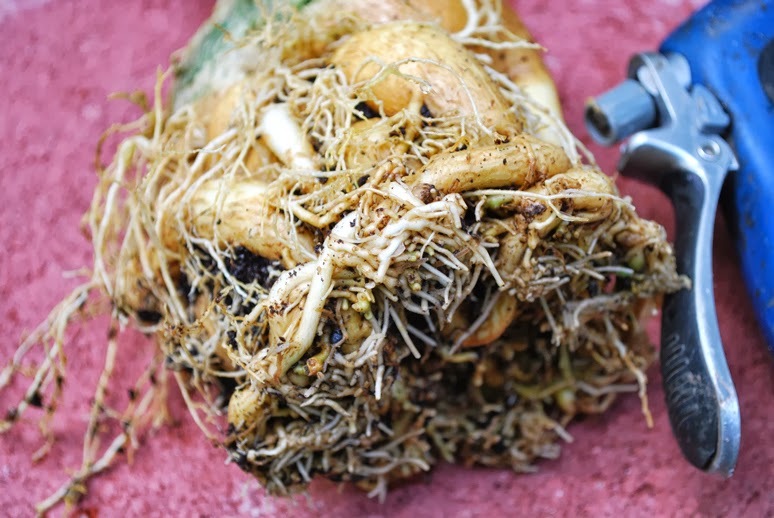 The only time you ever need to move your plant to a bigger pot is when you see roots coming out the drainage holes or when your pot is bent out of shape from the growing roots or when these growing roots actually destroy your pot. Remember that the longer you allow your plant to remain under the soil, the bigger they will get. What To Do: First, loosen the soil by tapping the pot on the sides. Then tip the pot to shake the soil out. The soil is very likely to be compacted and nasty. Wear gloves, by the way. You don't know what nastiness this plant has been treated with and in general, you should wear gloves when dealing with plants anyway. Once freed from the pot, wash your plant as thoroughly as you can, especially the roots which will probably be in a tight ball. You want to remove as much of the old soil as possible. 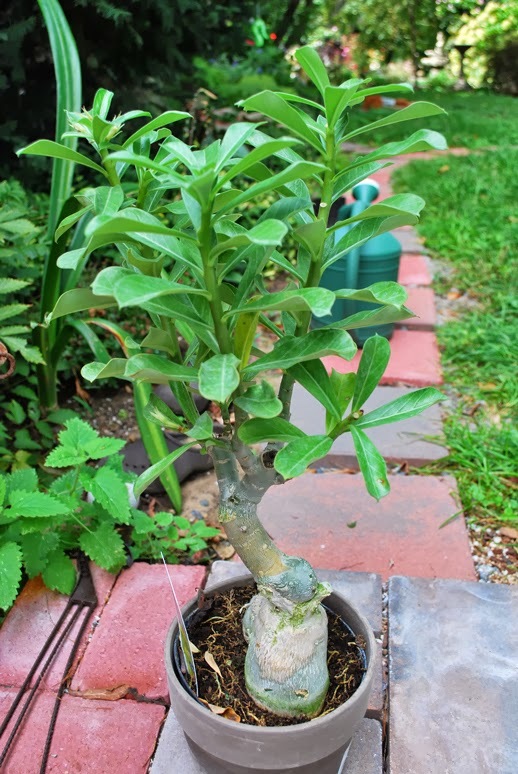 The roots of the adenium are extremely resilient and recover quickly so do not panic if you injure it a bit. A chopstick will be useful for prying soil material stuck in between the roots. A knitting needle is the best. If the plant has stains like the one on the right, you might be able to remove them by carefully brushing them off with a soft paint brush. A toothbrush will work faster but it is harder to avoid skinning the trunk or the stems. This adenium was acquired in autumn so I would rather not cause unnecessary damage to the plant that would need a lot of heat and sun to heal quickly. If you acquire your plant in warmer weather, you can probably take more liberties. That bit that sticks out under the graft point, for instance, might be sliced off in the spring. For now, it will be left on. 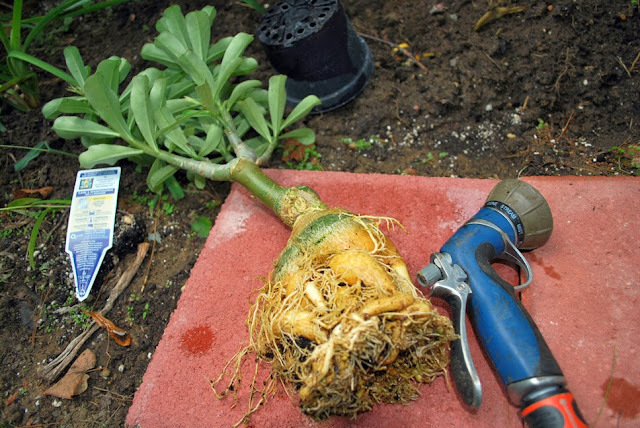 Examine the rootball and remove bits that look dead or mushy. You may even trim some of the overgrown feeder roots if you want. This particular plant is being prepared for dormancy so the rootball was left as is except for a thorough removal of the old potting soil. 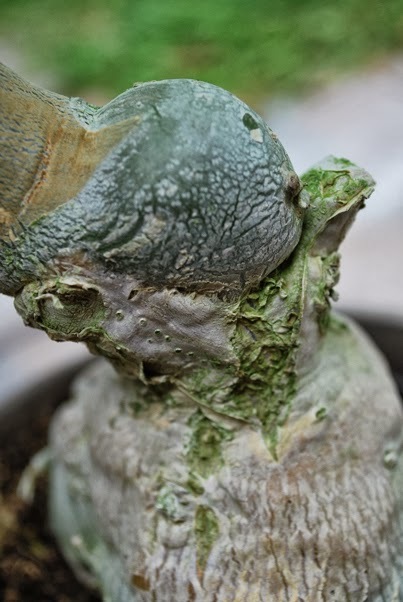 If you do not remove all that old stuff, it will create an unevenness in the new potting material where it will absorb and retain more moisture than the rest of the pot. This might cause root rot eventually, especially in the winter. 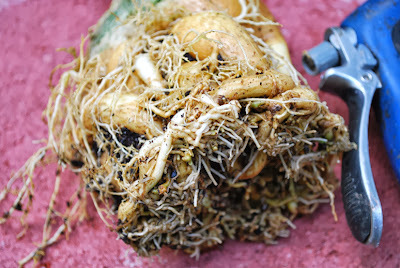 After you have removed as much of the old soil as you can by hand, you can now hold the plant under a steady stream of water and just kind of bother the tangle of roots a bit. This will also allow you to access dead bits and various detritus trapped in the rootball. Then, give the plant a thorough washing from top to bottom. You will need to allow it to sit and dry overnight before potting it up again. As a precaution, you can rinse it with a fungicide like that chamomile/ceylon cinnamon concoction. I personally did not bother. I just let the plant dry out a bit before putting it back in a pot. The 5:1:1 version of the gritty mix is the best but if you don't have it, use a combination of one part store-bought potting soil and two parts perlite. Wait another day before watering it unless you are preparing it for dormancy in which case do not water it again until it has dropped off its leaves. Your plant was probably raised somewhere warm and if it had been shipped to colder latitudes, it will drop its leaves anyway, especially if you acquired it in autumn. My particular plant took about two weeks out on the porch, out of the sun and without water to do this. After that, the plant was brought indoors and pruned because I did not like the way it looked. This tells you that when it comes to adeniums, there really is no hard and fast rule on when to do what to the plant. If you have the wherewithal to compensate for the effects of your experimentation, it will be fine. It will get just a bit of water throughout winter, out of the sunny spot. By summer, Fear and Surprise is in full bloom.